Wide compatible with smart mobile phone of all size. 1. This car mobile holder using new magnetic solutions: Enlarged magent contact area, and Enhanced 4 bigger & stronger magents. No worry about hitting bump anymore. 2. Magnet design wide compatible with mobile phone of all size. 3. Suction cup with super Sticky silicone pad, sticks securely to dashboard, windshield, any smooth flat surface, firm and does not fall off. 4. Extendable long arm design with 190 degree downward upward flip adjustment, and 360 degree rotation swivel. ✅ This car phone mount with new magnetic solutions: Enlarged magent contact area, and Enhanced 4 bigger & stronger magents. No worry about hitting bump anymore. 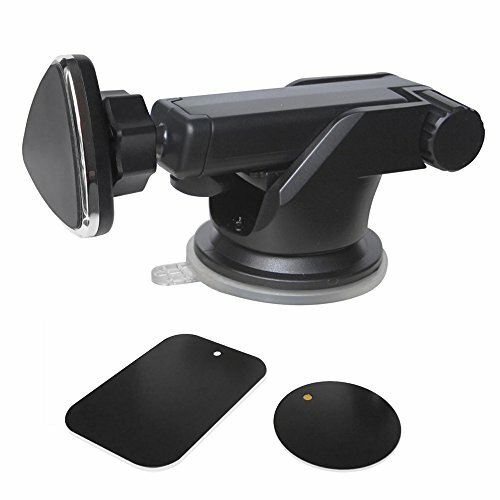 ✅ This magnetic car phone holder with extendable long arm design, provides a total 190° upward or downward adjustment and 360 degree rotation for a variety of angles and optimal viewing capabilities. You can easily adjust to obtain your best viewing. ✅ Wide compatible with smartphone of all size, Includes not limited: Apple iPhone X 8 8 Plus 7 7 Plus 6s 6s Plus 6 6 Plus SE 5, Samsung Galaxy S8 Plus S8 Edge S7 S7 Edge S6 S6 Edge S5 S4 Note 8 7 6 5 4 3 2 etc. ✅ Remark: The metal plate may cause interference to Qi charging functions, once the metal plate is removed, QI charging will return back to normal. It's recommended to attach the metal plate to the back of your phone case, or put it in-between your phone and case. If you have any questions about this product by CRage, contact us by completing and submitting the form below. If you are looking for a specif part number, please include it with your message.